A sign of strength within Sydney's prestige property strongholds, Australian developer Crown Group has revealed the details of its luxury penthouse apartments in Sydney's CBD, North Sydney and Parramatta. Crown Group has revealed that it sold all four level-27 penthouse apartments in its $250 million Sydney by Crown within 45 minutes of the official launch. Crown Group Director of Project and Commercial Sales, Roy Marcellus said the Sydney by Crown penthouses allowed buyers to own a prestigious home in the city's next architectural centrepiece. 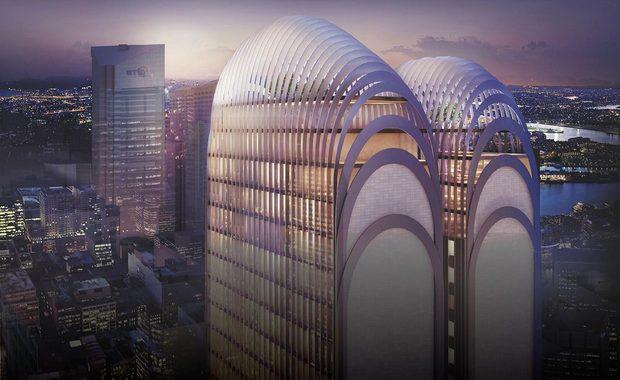 Designed by Koichi Takada Architects, the building will feature heritage-inspired lower levels transitioning to a glass and steel tower with more than a dozen steel arches. "The success of Sydney by Crown's penthouses is proof the luxury market is alive and well," Mr Marcellus said. "The penthouses at Sydney by Crown represented a chance for buyers to secure a top-tier, luxury retreat with unrivalled views of Sydney's CBD and surrounds. ""The phenomenal sales results reflect customers' awareness of the premium quality and exclusivity we're introducing through our penthouse collections," he said. North Sydney's Skye by Crown development was also in high demand with each of the five penthouses sold in rapid succession. "The rapid sale of all five penthouses reflects the demand for luxury apartments with a private, luxury oasis on the upper-floors of the building," Mr Marcellus said. Crown Group has also included another six penthouse apartments in the Allen Jack + Cottier-designed V by Crown in Parramatta. Coined as Parramatta's 'Vertical Village', the development is due to be released to the market in 2015. Crown Group Director of Project and Commercial Sales Anthony Falas said there was already strong interest in V by Crown's penthouse apartment collection. "The penthouses at V by Crown will be arguably Parramatta's most outstanding apartments showcasing all the benefits of luxury living in Sydney's second CBD," he said. "These apartments will raise the bar for luxury living in Western Sydney," Mr Falas said.